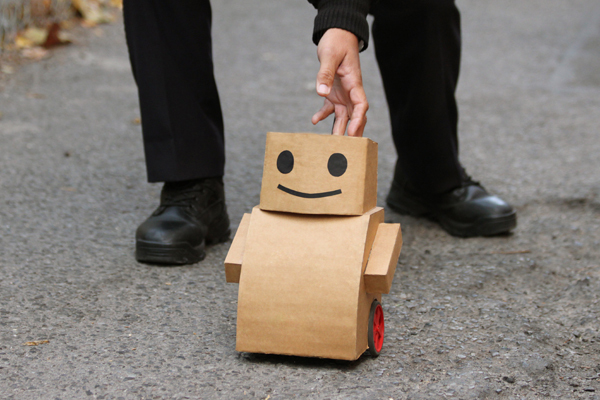 Tweenbots are human-dependent cardboard robots that navigate the city with the help of pedestrians they encounter. Rolling at a constant speed, in a straight line, Tweenbots have a destination displayed on a flag, they rely on people they meet to read this flag and to aim them in the right direction to reach their goal. 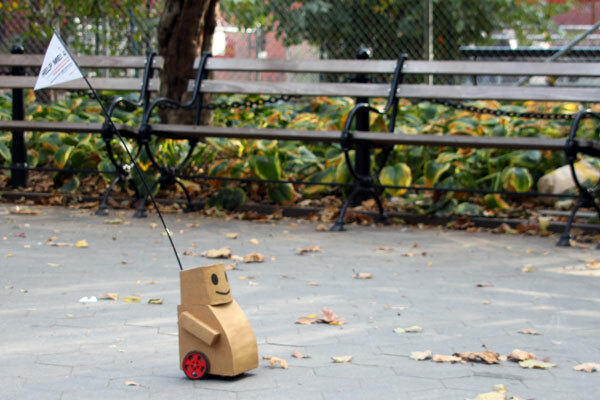 The Tweenbot’s success is dependent people’s willingness to step outside of habitual actions and engage with a technological object in the city space. As emotive characters placed in the improbable setting of the city, Tweenbots create an unexpected interaction, disrupting the narratives of our everyday experience, and offering a fleeting and playful connection in the context of the city street. 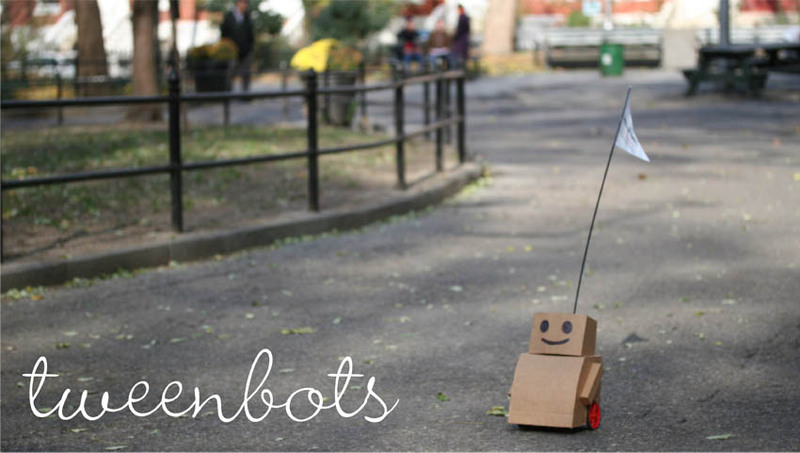 I walked out to Washington Square Park on a sunny summer day, placed my first Tweenbot on the sidewalk, and walked away. 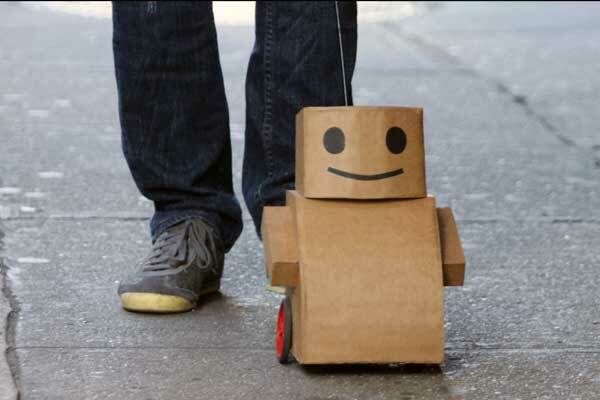 From a distance, I observed as the Tweenbot––a smiling 10-inch tall cardboard missionary––bumped along towards his inevitable fate. Every time a Tweenbot got caught under a park bench, ground futilely against a curb, or became trapped in a pothole, some passerby would always rescue it and send it toward its goal. Never once was a Tweenbot lost or damaged. Often, people would ignore the instructions to aim the Tweenbot in the "right" direction, if that direction meant sending the robot into a perilous situation. One man turned the robot back in the direction from which it had just come, saying out loud to the Tweenbot, "You can’t go that way, it’s toward the road." The Tweenbot’s unexpected presence in the city created an unfolding narrative that speaks to the power of a simple technological object to create a complex network powered by human intelligence and asynchronous interactions. The journey the Tweenbots take each time they are released in the city becomes a story of people's willingness to engage with a creature that mirrors human characteristics of vulnerability, of being lost, and of having intention without the means of achieving its goal alone. 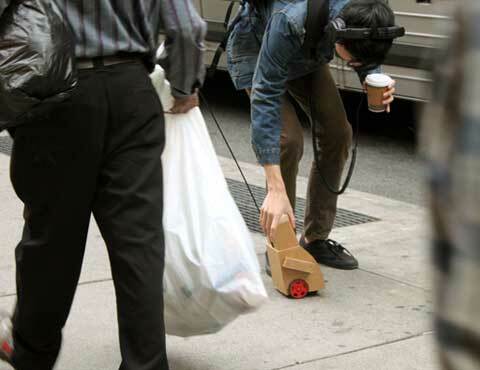 As each encounter with an empathetic pedestrian takes a Tweenbot one step closer to reaching its destination, the significance of our random discoveries and individual actions accumulates into a story about a vast space made small by an even smaller robot. The Tweenbots are now part of the permanent collection of the Museum of Modern Art (MoMA) in New York. For future Tweenbots updates, click here! Copyright © 2009 Kacie Kinzer. All Rights Reserved. Please do not reproduce images, video, or text without permission.